Laura & Vinny, our fantastic guest bloggers, were invited to a dinner date at Browns Bar & Brasserie on Newcastle’s fashionable Grey Street. The moment we walked into Browns we were completely blown away by the beautiful decor and inviting atmosphere. The restaurant has a classic European brasserie feel, with live piano music and smartly dressed waiters lending an air of sophistication. An impressive circular bar forms the focal point as you enter, with a view into the kitchen at the far end, and seating areas either side, which are stylish without being too formal, offering a relaxed ambience. 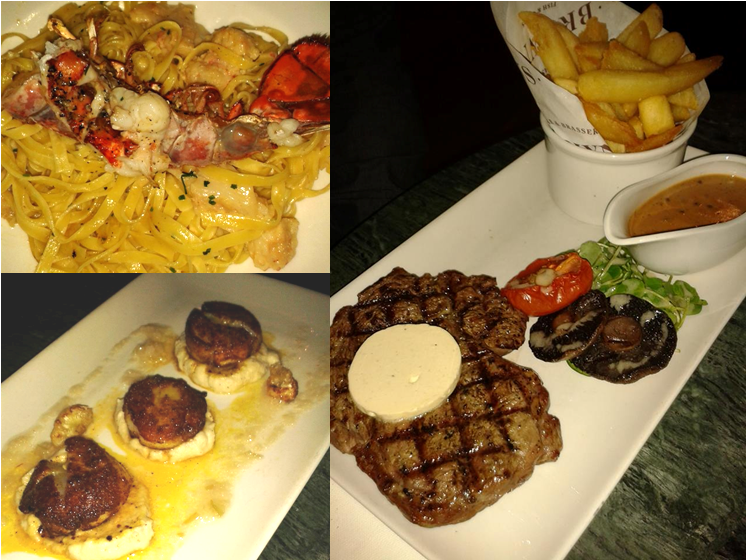 The extensive a la carte menu offers a good selection of dishes to share: starters, salads, fish & pasta, classics & grills, or you can go for one of their ‘Plats du Jours’ with enticing options such as lobster on Thurdays or posh Surf & Turf on Friday: perfect for a special treat. In addition, menus for lunch and early dinner; finger food, breakfast, brunch & afternoon tea and a Sunday menu means that diners are spoilt for choice whenever they visit. Our starter of duck and parsley terrine with rhubarb and tomato chutney accompanied by soft, toasted cinnamon brioche was just what you want and expect of a terrine and was easily on a par with any others we’d tasted recently. However, the real star of the starters were the pan seared scallops, which were cooked beautifully. Sometimes when ordering scallops they can come out overcooked and dry but there was no such problem here. The three large, plump scallops were moist and succulent and the dusting of mild curry powder and cauliflower puree only helped to lift the flavours. We visited Browns on a Thursday evening which was lobster night. Unfortunately, at seven o’clock, we were too late and the kitchen had already run out of the lobster special. We had been looking forward to trying this dish so we were disappointed, but the waiter suggested the lobster tagliatelle from the a la carte menu which was still available. Served with flaked lobster in a light cream and white wine sauce and topped with half a grilled lobster tail still in its shell, it was delicious and well-cooked and proved to be a wonderful alternative, so they had our complete forgiveness! We also tried the 28-day-aged rib eye steak which was one of the the best steaks we’ve ever had. The steak comes with chunky chips and you can add a choice of sauces. We opted for the tasty peppercorn sauce, which was mild, thick and creamy. The portion sizes throughout the night were ample and really satisfying: a good thing when the dishes are so moreish! Throughout the night the service was impeccable – quick, friendly and with the manner of a well-trained staff from the most expensive of restaurants. We’d definitely recommend Browns for a memorable evening out – in fact it makes the perfect venue for a romantic date. We had no idea such a gem existed in the heart of Newcastle city centre and we can’t wait to go back and try out more of their menu! Browns can be found on 51 Grey Street. You can also check out their Facebook and Twitter pages.